Sorted magAZine presents the first in an occasional series of profiles of figures from the Irish music biz. 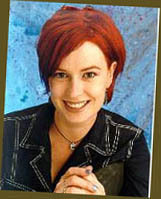 Uaneen Fitzsimons is the presenter of the alternative and very cred music programme, "No Disco", on RTÉ television and has also been known to MC the odd major music festival. Uaneen Fitzsimons leans conspiratorially close to the mike. "Get people to write in", she whispers, conscious of the presence of RTÉ heads sipping their Cappuccinos. "That's all it will take." The matter in question was that of No Disco's ridiculously late Thursday nighttime slot. Though the alternative music programme is holding its own in terms of viewership, Uaneen believes its inaccessibility is keeping it down in the ratings. "Bono watches it all the time" she giggles proudly. A former Dublin City University Communications graduate, she has fond memories of her student days. Living in a flat in Drumcondra, she recalls an incident where she and her flat mate survived on lime jelly for a week. She was mates with Donal Dineen who she went to music gigs with and was gobsmacked when he landed his own music programme, "No Disco". "I was in the States for the summer and my mother rang to tell me the news. I couldn't believe it because he was really quiet and reserved. I thought, that would be my dream job." Uaneen got her first taste of broadcasting when she trained at BBC for a year with Mike Edgar. "I loved it", she smiles, toying with the cigarette I had just given her. From there, she reviewed bands for Jo Maxi and did PR work for Frontier Films, the Ormond Multi-Media Centre and produced a programme for Celtic Vision. "I worked around the clock for about two years, to build up CVs". So it's a difficult area to get into then? "Oh God, yes. I came out to RTÉ knocking on doors and talking shite. But if you build up contacts then your name will travel". When Donal Dineen left "No Disco", many assumed it wouldn't go on without its charismatic, laid-back frontman. Uaneen got a call from RTE asking if she would be into it. Three years later, she hasn't looked back. She has interviewed anybody you care to name. The most difficult was John Squire, formerly of The Stone Roses and now with The Sea Horses. "He was just obnoxious and we ended up being really sarcastic with each other". She met him again this year at Slane and said he was actually "really sound". Uaneen became good mates with Huey from the Fun Lovin' Criminals when the band toured Ireland. Sinead O' Conner disclosed some of her darkest secrets. The Prodigy were "really sweet" (!) and U2 gave an exclusive interview to the programme. So just why do people respond so well to the fiery haired Ardglass girl? "Nobody has been obnoxious", she says modestly, "you just know not to ask the Manics how they feel now they've lost a member of their band". When she hosted Slane, she boosted the lads' confidence by declaring to the crowd that they were the reason she was there. James Dean Bradfield was supposed to be Andy Cairns of Therapy's best man but couldn't make it because of a major gig. Uaneen is good friends with Therapy as well as Ash who she often meets in her local. She once sang in a Karaoke with Bono and Michael Hutchence at one of Jim Sheridan's wrap-up parties. She stood outside the Olympia with Neil Hannon when the bouncers wouldn't let him in to play his gig. Currently on her Walkman is the Tindersticks compilation album, Mercury Rev's "Deserter's Songs", Placebo's "Pure Morning" ("it's growing on me") and Unkle's "Psyence Fiction". She is working on editing the Big Day Out at present and will be interviewing Asian Dub Foundation and David Gray in the coming weeks.